There may have been stones on either side David?, but now gone. # 1631 David 4 oldest son of Lt. John 3, (Joshua 2,John 1) BIGELOW and Hannah______, born before 22 Sep 1706 Hartford,Hartford,CT. Baptized on 22 Sep 1706. (27 Sept 1706 another source)( It was the custom to baptise infants on the Sunday following birth.) When he was an infant, the family moved to Colchester, New London, CT.
Married (1) about 1726 (11 Dec 1729- see below) Editha (Edith) DAY, daughter of John and Grace SPENCER DAY, who was born 10 Sep 1705, and died 19 Jan 1746 in Colchester,New London, CT. Picture above taken 10/20/95 at Cemetery Rd. Cemetery, near Marlborough. They had 8 children. Married (2) 21 Jan 1747 Mrs. Mary (Mercy) LEWIS, widow of Rev. Judah LEWIS, and daughter of Stephen and Lydia (BELDING) KELLOGG. She was born 30 Oct 1709. 4 children. She died 5 Jan 1795. David died 2 Jun 1799, both in Colchester,New London,CT. They lived in that part of Colchester which was later set off as the town of Marlborough. 16311 Hannah, born 11 Nov 1730; died 1 Jun 1806 Cambridge, Washington co,NY. m Barrett PHELPS; resided Hebron,CT and Cambridge, NY. 15 children. Patience FOOTE; (2) Priscilla (AMES) STRONG; res. Marlborough, CT. 7 children. 16313 Amasa, b 3 Sep 1733; d 12 Mar 1811 Brookfield, Orange co, VT; m 31 Dec 1754, Jemina STRONG; res Brookfield, VT from 1780's on. 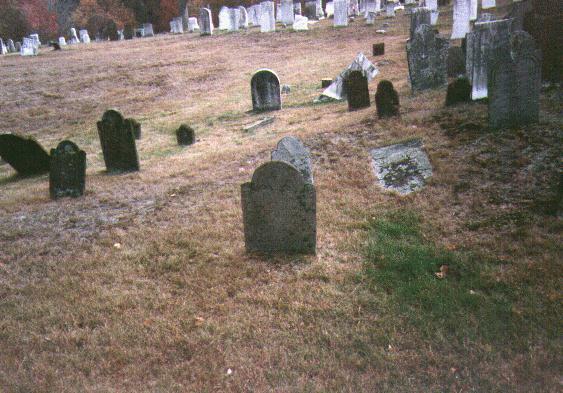 13 children all born CT.
16314 Ezra5 , b 10 Apr 1736; died unknown date, but will probated 1808 at Geneseo, NY; m (1) 1 Sep 1755 Hannah STRONG; (2) 6 May 1779 Lois HORTON. Lived Colchester to 1806, then NY state. 9 children. 16315 Daniel, b 25 May 1738;d 11 Nov 1822 Marlborough,CT;m(1) 8 Jan 1761 Mary BRAINARD; (2) 11 Jun 1778 Sarah F. (CHAPMAN) INGHAM; res Marlborough. 14 children. 16316 Eli, b 25 Aug 1739; died 10 Aug 1751. 16317 Azariah, b 26 Dec 1741; died 5 Feb 1812 Marlborough; m 26 Mar 1767 Margaret FOOTE; res Colchester. 6 sons. 16318 Editha, b 16 Mar 1744; res Haddam,CT. 16319 Stephen, b 27 Oct 1747; d 13 Sep 1748. 1631A Stephen, b 5 Jun 1749; d 5 Aug 1751. 1631B Moses, b 4 Oct 1750; d 23 Dec 1750. 1631C Mercy, b 23 Nov 1753; d 3 Aug 1832 Norwich,VT; m 12 Nov 1772 Joseph LOVELAND; res Colchester & Norwich. 13 children. Bigelow Society,The Bigelow Family Genealogy Vol I, pg 68. Wm.H.B. Bigelow, Genealogy of a Branch of Bigelow Family, 1877. Enjoying your web pages. Am a descendant of Lt Joseph Kellogg and Abigail Terry through Stephen Sr. My records are his sister's name who married David Bigelow is Mercy. Dates are all the same. My info came from several genealogies of the family and no sister of the name Mary is listed. However, I never checked this info against "Kelloggs in the Old World and New" Is this where you obtained her to be name Mary? As I looked through your other pages I found that David's wife is listed as "Mary (Mercy)" on his father's page. On this page it reads that David and Mercy had no children, but on David's page it lists they had 4 children. Hate it when that happens. After a 500+ page book I did of my family and a 300+ page book for my wife's family - I found similar contradictions. Such fun.